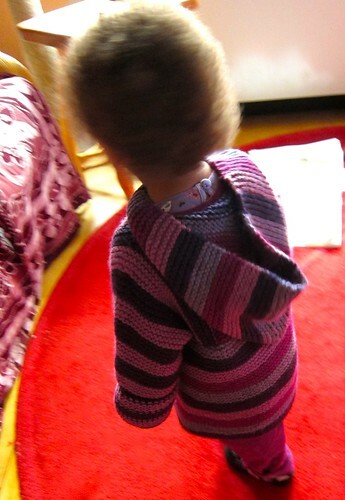 Accomplished: the stripey purple Tomten toddler sweater hoodie. Not Accomplished: getting toddler to stay still in front of a plain backdrop for a proper photo. Readers, I don't want to scare you, but I've been having dreams about yarn. Big, soft, luscious skeins of snuggly soft wool in bright colors, falling from the sky and turning into magical socks, cardigans, scarves, shawls, hats... Well, I'm not sleeping well, and it's kind of a problem. I recognize well the usual signs of obsession I dedicate to all things sewing. The other day I found myself pulling ALL of my back issues of Interweave Knits and Vogue Knitting off the shelf and just sitting with them in a pile on the floor daydreaming (which is something I normally only do with Threads and BurdaStyle). I've even been reading knitting blogs instead of sewing blogs on my iPod Touch as I lie in the dark nursing the toddler off to sleep. But please don't be concerned. I may be feeling the lure of the loop, but sewing is my entree, and knitting will forever remain a side dish. Mainly because too much knitting aggravates old repetitive stress issues I used to have. 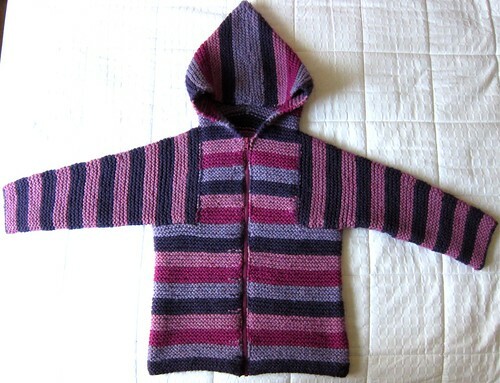 I actually gave up knitting entirely for a year, and when I started up again, I kept it GLACIAL and SPORADIC, and sold most of my dashed yarn dreams on EBay. 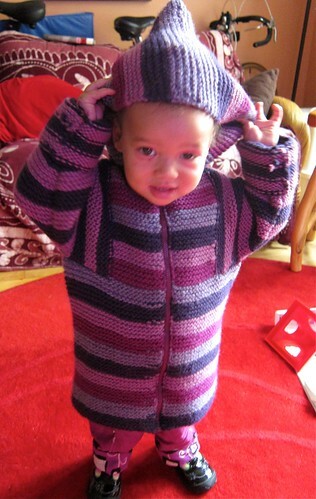 Pattern: Tomten jacket by Elizabeth Zimmerman. An awesome modular classic EZ pattern, but beware the giant arms, they require half as much yarn as the hood and body combined. Note: No details are included on how to insert the zipper. In the ancient copy of Knitting Without Tears I learned to knit with, so: FREE. 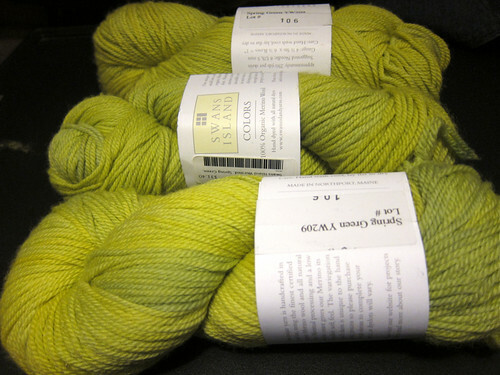 Yarn: Berocco Vintage Chunky (50% Acrylic, 40% Wool, 10% Nylon). I used 6 skeins, and I almost ran out at the very end. I chose it because of the colors, and it's nice enough, but I hate that it's only 40% wool and am not sure if I'd ever use again, especially on a kid (acrylic = flammable, wool = magic and flame-retardant). Paid for with a gift certificate from the hubby, so I'll say: FREE. Needles: Size 9 circulars (used to knit flat). Notions: Separating plastic YKK zipper from SIL Thread, $3. For full details and notes on how I inserted the zipper (shorter version: by hand, with a backstitch, took AGES) and hid the color changes (or at least, started hiding color changes halfway up when I realized my "who cares, it's a kid's jacket?" attitude was lacking), see the Ravelry project page. In other cheating on sewing news, thanks to an excellent suggestion from a commenter here, I decided to block my too-small 18 Seconds to Sunrise blue cowled alpaca hat in hopes it would grow... and it did! But after wearing it for two days, I have decided that while it is no longer "PAINFULLY tight," I would still call it "ANNOYINGLY snug." We'll see if I ever get around to correcting. I used the traditional weaving method on the left (Knitting Daily tutorial here), with less-than-amazing results--the patch is obvious, thick, and not very stretchy, though it has a certain Dickensian charm. 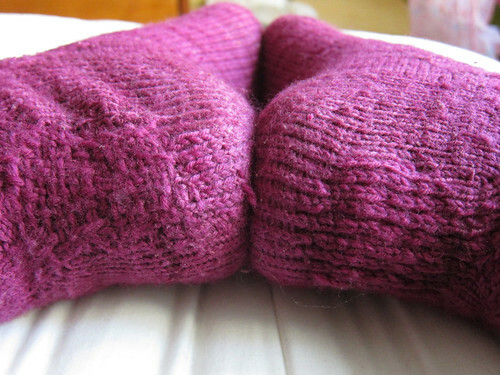 For the sock on the right, I used the duplicate stitch method (HJS Studio tutorial here). It was maybe SLIGHTLY more time-consuming, but much neater and stretchier, and it just blends in way, way better. No contest, really. I can't wait to darn EVERYTHING now: more socks, holey sweaters, and my Sew Grateful colorblocked skirt. Or can I? Tonight I traced the patterns for my spring and summer tops, so maybe this fever is passing. And I'm even thinking I might be able to get back to my Joan dress, now that I'm over missing the deadline so badly. 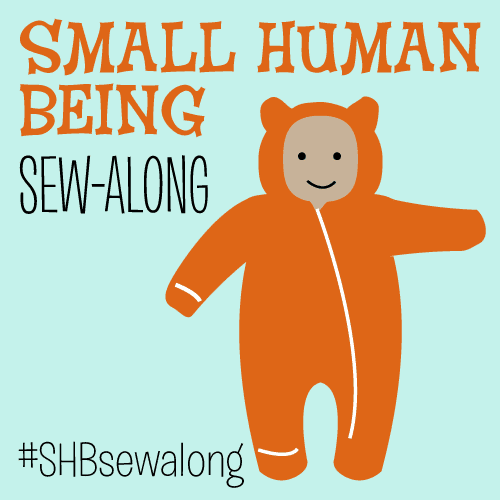 So readers: do you ever cheat on sewing with other hobbies? How long does the madness usually last before you come to your senses? Agree on your darning results, no contest. I always make socks out of wool+something, in which something is silk or nylon or mohair or something very resistant to wear. That way, when the wool is abraded away, I still have a skeleton left to duplicate stitch on top of, if that makes sense, and that is easier than fixing a gaping hole. Lovely Tomten! Garter stitch anything takes a long time, that's the nature of the stitch! I totally did NOT know that about garter stitch--it would explain a lot! I'm halfway through a pair of socks now, and I could swear it's going WAY faster than that sweater, even with occasional subway knitting. She looks adorable in that sweater! I regularly cheat on sewing with more portable hobbies: knitting while I sit with my daughter during homework time; beadwork during lunch. I rationalize by saying that all of the skills feed each other (very true with knitting and beadwork, at least). Right, exactly--those are all times in which I wouldn't be sewing anyway! I guess you could see my knitting as cheating, but I only do it at times when I wouldn't be sewing anyway, like while commuting or traveling for work. Then there is my baking, which has more of a symbiotic relationship with sewing (mix dough/batter & put in oven - sew while it's baking - take out of oven - sew while it cools - eat baking to fuel sewing...) Really, sewing is tops for me. I should try that with baking, I just tend to raid the fridge when I need fuel and end up eating old pickles and random pieces of suspicious cheese. Yeah, actually, that's a good point... I've sorta been cheating on cartooning with EVERYTHING I do lately, though I do DRAW designs I want to make just like you do. Although cartooning eventually just lost a lot of the fun for me because it was a part-time job with strict deadlines, not an unpaid hobby. 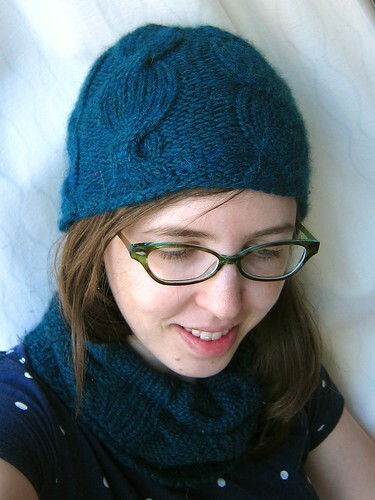 Reading this post makes me want to learn how to knit so badly! I adore the little jacket - she is just too adorable and the colors are fabulous :) Your chartreuse cardigan is going to be AWESOMESAUCE. I'm constantly cheating on one hobby with another hobby. Sewing, gardening, baking, banjo playing ... I flit from one interest to another.